I struggle with determining whether or not holding an Open House for your listing is truly valuable. Often times, you only get “Lucy Lookers” and “Nosie Nancys” from down the street. Other times, if your home is staged appropriately, the right potential buyer has found your home online and made an offer before the first weekend Open House event. Nonetheless, if you choose to hold an Open House for your listing, the property must present perfectly and create a lasting memory for potential buyers. For the past few weekends, I have toured Open Houses local to me and brought my “buyer’s eye” with me to each one. I came across these five mistakes to avoid at your Open House and hope that you find my notes to be useful. You, too, should tour your local Open Houses prior to holding your own, so that you can learn about the temperature of the local market and your competition. Bad MLS Photos: Prior to embarking on the Open House Tour in my neighborhood, I pulled up the MLS listings and viewed the online photos of each property offering an Open House for the coming weekend. I used these photos to compare the homes to one another and make out my list of which ones to view. I only gave myself 3 hours each Sunday to tour the homes, and these photos helped me determine which properties are worth my time. Real Buyers will do the same! Your online MLS Photos must be on point to get buyers to your Open House. It is a very BIG mistake to take rushed photos to throw online just to get the listing published. Staging must happen BEFORE the photos are taken and published, and a professional photographer should work with your stager and agent to ensure your listing is presented well online. Curb Appeal: As I drove up to each property, I scanned the outside to see if I thought it was a pretty home that appeared to be well kept. If a home was unattractive or run down, I kept driving. Buyers will too! For tips on how to stage the outside of your property, check out It’s What’s on the Outside That Counts! Home Staging Tips for the Best Curb Appeal. I saw a few properties with overgrown bushes, newspapers and leaves on the porches, and LOTS of yard décor. No one has an appreciation for the garden gnome your 3rd grader painted like you do. It is best to pack this family treasure away for safe keeping until the move. Also, I’m not quite as big of a fan of the Houston Texans as you. The flags out front should be taken down until next season, when you’re all moved in to your new home. Overwhelming Odors: Potential buyers should not be hit with any strong smells as they enter your Open House. I witnessed a variety of offensive smells while touring Open Houses, such as food odors, strong cleaners, scented oil warmers, pets, and old musky carpet. Many may think the scented oil warmer smells just like that beachy breeze it features on the package; however, other buyers will wonder why you are pumping it into the air so strongly. What are you trying to hide? It’s best to just deep clean the house with natural cleaners, and let it smell naturally fresh. Open the windows for a few hours the night before to get the air circulating, if you are worried about lingering smells. Your stager will provide feedback regarding any odors that could be detected by potential buyers and will offer tips for improving the smell of your home prior to your Open House. The Sale-blocking Open House “Host”: First and foremost, the seller should NEVER be present during an Open House. This makes potential buyers uncomfortable. However, the seller should be available by phone in the event that the agent needs assistance answering questions from potential buyers. Additionally, your listing agent will most likely not be the same agent hosting your Open House event. Some of the most alarming mistakes I noted during my Open House tour were made by the agent at the Open House, or the “Host.” Be certain the Open House event is staffed by a professional agent, who is knowledgeable about your property and is motivated to sell it. I was approached by several unprofessional agents at various open houses, and a few of these host agents certainly would have killed any potential offer from me. One agent was dressed in a t-shirt, tattered old jeans, and dingy socks with a hole in them! I assume he removed his shoes to respect the shiny new hardwood floors; however, the rest of his attire was inappropriate as well (and at least wear new socks, if potential buyers will see them!) He also didn’t greet me at the door. I found him lurking in the kitchen at the back of the house and actually had to ask, “Are you the agent?” before inquiring about one of the property’s features. Another host agent was enjoying some fast food with a friend at the kitchen table. Their lunch created an offensive odor throughout the home, and I felt as if I were interrupting. I ended up rushing through the home, so he could return to his date. I also entered one home at which an agent was enjoying an action flick on the seller’s big screen with surround sound on in the living room. The movie was blaring loudly and impeded on my ability to ask questions (or even think straight). One agent commented on the low ceiling height in the home without me even asking or hinting that it bothered me. This same agent highlighted that a large storage cabinet in the kitchen would not be staying, but that it gives “us buyers” a good idea about how storage can be added pretty easily. Instead of working with a stager to highlight positive features and downplay negative features of the home, these sellers have entrusted an agent to host an open house before the home was presentable and with a host agent who actively pointed out these negative features! Rooms with an Identity Crisis: Media Rooms should be media rooms, and bedrooms should be bedrooms. Studies should be studies, and dining rooms should be dining rooms. Buyers do not appreciate the fact that you both work from home and never host dinner parties. Keep the home office in the study, and showcase entertaining space, if you have it. One home I toured had a large entryway with beautiful tiled floors in the center of the home. Just off of the entry was a spare bedroom, which housed a mismatched desk and shelving unit, office chair, accent chair and ottoman (all crammed into an 11 x 11 bedroom). Across the entryway was a large room with French doors at the center of the home, and this room housed three mismatched accent tables, two ottomans and an empty china cabinet. I actually asked the agent, “What is this room?” She proceeded to tell me that the floorplan says it is a study; however, the seller used it as a sitting room. She explained that the seller is moving out of state and already sold off most of the furniture she wasn’t planning to move, which is why the room was mostly empty. I wanted so badly to pick up the odds and ends in the study and move them to the garage. Then, move the office furniture out of the spare bedroom and into the study. This would have been a FREE staging job that could easily be accomplished by the seller herself. This room was really important for the sale because it was off the main entry and at the heart of the home. It was a uniquely-sized office that families could also use as a bonus playroom in this one-story home. A HUGE staging opportunity was missed here, and I am guessing the offers were missed as well. Another challenge I noted was with media rooms. Yes, they add extra square footage, but buyers do not always appreciate this room enough to pay for this square footage. 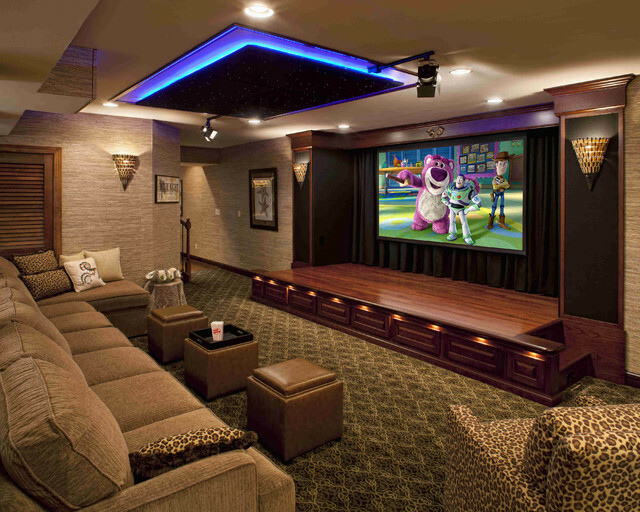 For this reason, media rooms must be staged to the MAX to create buyer’s desire to recreate the same lasting memory with their family every Friday night in their new home. Caution: This applies ONLY to proper media rooms. Please do not make the mistake of attempting to turn a spare bedroom into a media room. Painting a small room a dark color and filling it with large chairs, featuring built-in cup holders, will only make potential buyers notice the small size and annoying paint job added to their Honey Do list upon move in. Buyers appreciate move-in ready rooms that are identifiable for the intended purpose. Bonus Mistake – Honorable Mention for the “Unmentionables”: Be sure all laundry is hidden, especially dirty “unmentionables.” I came across several piles of laundry on my open house tour, especially in the back corner of closets. Remember, buyers will be looking in closets to check out your storage space. Dirty laundry adds to odors, lack of storage and clutter. Also, if you have front-loading washer and dryers, be certain they are emptied before the Open House. I’m pretty certain one family crammed ALL of their laundry into the machines and rushed out the door. I’ve never seen so many squished socks in one washer!